This annual one-day learning forum is celebrating its 14th year! Mini-University 2015 will offer over 60 sessions in one of the eight technical tracks environmental health; family planning & reproductive health; health systems; HIV and AIDS; infectious disease; maternal, child, neonatal health; non-communicable disease & injury; and nutrition. SPRING will be participating in the nutrition track, so look for us there! 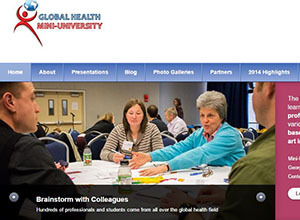 Mini-U is a collaborative production of USAID, the George Washington University, and the Global Health Professional and Organizational Development (GHPOD) Program. This session will begin with a plenary discussion on the fundamentals of SBCC for nutrition and go into detail on the types of things to consider when designing a behavior change program for nutrition. It will detail key ways of thinking about change and the latest evidence on how to promote change for globally recognized high–impact nutrition behaviors. The group will then break out choosing one of two roundtables to hear about the exciting work that SPRING is doing in nutrition SBCC. One roundtable will detail SPRING’s work in community media and showcase the use of pico projectors to promote recommended infant feeding behaviors in rural India and Niger. The second roundtable will explore the work SPRING is doing investigating SBCC design and delivery at the intersection of agriculture and nutrition. The global nutrition community is increasingly recognizing the importance of a multisectoral approach to improve nutrition. Evidence of how to effectively develop, implement, and adapt multisectoral nutrition strategies and programs remains limited. This session draws on experiences from USAID’s SPRING Project to share promising practices on multisectoral nutrition programming. Speakers will provide examples of SPRING’s work across the projects core technical areas, which include: 1) a case study exploring government prioritization of and resource allocations for multisectoral nutrition activities; 2) implementation of multisectoral anemia platforms; 3) the emerging landscape around the promotion of high-impact, nutrition-related behaviors and social change across sectors; and 4) an in-depth look at effective ways to integrate and coordinate agriculture and nutrition strategies in Guatemala. Agriculture provides food for all human beings, thus having a foundational role in nutrition. However, agriculture is not only a source of diverse nutritious foods and income; its effect on nutrition is multifaceted considering women's critical role in agriculture. Women's time availability, energy expenditure, and access to/control over productive resources and income affect their own and their children's health and nutrition status. While agricultural growth is associated with greater reductions in stunting than non-agricultural growth, the full potential of agriculture to improve nutrition has yet to be realized. This session shares the current state of knowledge regarding agriculture-nutrition linkages and provides a set of pathways and principles for improving nutrition through agriculture.